Optimizing the Windows Registry, the Registry Editor, registry tweaks and tracking changes to the registry. This page explains how the registry is build up, how to optimize it by defragmentation and cleaning, making changes to registry values with the registry editor and the tracking of registry changes with a tool like Process Monitor. Making changes to the registry and registry tweaks is discussed in many computer magazines and Windows related websites. It is very useful to have some knowledge concerning the registry, because many settings are only available by a register tweak and not by the user interface. However, for many the registry is an unknown area and the intimidating warnings hold back the user of making any manual registry changes. Those warnings are rightly, because making the wrong changes can cause programs to malfunction or Windows won't boot anymore in worst case scenario. But as long as the changes to the registry are as suggested (and no other changes have been made), the risks are limited. Almost every change in the settings results in a specific change in the registry values. When the registry value which has to be changed for a certain setting is known, then the registry change can be stored in a registry file. This file can be used to apply the setting quickly to other computers and user accounts. For this reason, it would be interesting to track the registry changes which are a result of changes in settings by the user interface. Process Monitor is very useful for this purpose, more about this tool at the end of this page. Windows stores most settings for Windows, hardware, software and the user account in the registry. All registry values are loaded at the startup of Windows and the user account and is consulted by almost every process. The registry is clearly arranged with a simple tree structure (just like the file system on a hard disk shown in the Windows Explorer) and contains many registry keys and registry values. The registry keys are comparable to the folders and the registry values (which contain the settings) are comparable to the files in these folders. Without this clear structure, it would be hard to find any registry value. After opening the registry editor, this tree structure of registry keys is shown (the registry editor is started with the command REGEDIT in the run/search field of the Start Menu). Contains file extension associations and COM class registration information. HKCR is a combination of the sub keys HKLM\SOFTWARE\Classes and HKCU\SOFTWARE\Classes. Contains the preferences of the current user (user level settings). If there is another administrator account, it is relatively safe to make changes to the registry values in this key. Contains settings to define the physical state of the computer, independently of the logged on user account. Contains the default settings for a new user account and the settings of the already logged on user account (HKCU is actually a sub key of HKU. The information in this key is used for the chosen hardware profile (in most cases there is only one available) and stores similar information to the sub key HKLM\SYSTEM\CurrentControlSet\Hardware Profiles\Current. Actually, there are only two registry keys (HKLM en HKU) because the other registry keys are sub keys of these two keys. For storing strings (plain readable text like a filename, storage location, the text of a button in a program,...). For storing a number with a maximum of 32 bits. DWORD Values are mostly used for storing settings (written as a number) like: yes/no, on/off, visible/hidden, color, ...(sometimes a String Value is used for storing settings). Within Windows Vista there is a 64-bits DWORD value as well. For storing raw binary data, displayed in hexadecimal format. TIP: The DWORD Value 0 and 1 mostly correspond to off and on respectively for the given option. Every bit has the value zero or one, therefore it is a binary value. Every byte contains of 8 bits (8 values of zero and one), therefore there are 256 possible values (28=2*2*2*2*2*2*2*2=256). These 256 possible values are sufficient for displaying the different values of a String Value. Because a 4 bits value can result in 16 different combinations (24=2*2*2*2=16), these 4 bits can be easily displayed with a hexadecimal value, like: 0, 1, 2, 3, 4, 5, 6, 7, 8, 9, A (=10), B (=11), C (=12), D (=13), E (=14), F (=15). The hexadecimal value E stands for the binary value 1110, the equivalent of the decimal value 14 (1*23+1*22+1*21+0*20=1*8+1*4+1*2+0*1=14). Because one byte contains of 8 bits, a byte can be displayed with 2 hexadecimal values. For this reason, the bits 11101111 is displayed with the hexadecimal value EF (which corresponds to the decimal value: 14*16+15=239). A String Value stores every single letter/symbol in one byte (8 bits with 256 possibilities). A DWORD value uses 4 bytes (because there are 8 bits in one byte, it is called a 32-bits value). The maximum decimal DWORD value is 4.294.967.295=232-1 (or the hexadecimal value FFFFFFFF, which is a lot easier to read). For a simple display, a binary value is displayed by a hexadecimal value as well (like "2F D7 0A 28 9C 00 2E 33"). The registry values are stored in files which are loaded at the startup of Windows and at the logon of a user account. The registry values with system specific settings (HKLM), are stored in the folder C:\WINDOWS\system32\config (the files like DEFAULT, SAM, SECURITY, SOFTWARE and SYSTEM). This folder contains a number a copies for back-up purposes, recognized by the added extension (like BAK or SAV). The user account specific settings (HKCU) are stored in the file NTUSER.DAT in the personal folder (XP: C:\Documents and Settings\loginname, Vista: C:\Users\loginname). While using the computer, there are continues changes of the registry values. It is only a matter of time, but eventually the registry becomes clogged with orphaned or misplaced values. There will also be a lot of empty spaces within the registry file as well (which are the result of continuously adding and deleting values). After a cleanup and defragmentation of the registry, the computer should boot faster and have more valuable system resources available. By defragmenting the registry, the empty spaces within the registry files are removed with a smaller registry and more valuable system resources available as a result. On a new installation of Windows XP or Vista (after the installation of updates and the installation of software), in general a 10% smaller registry is possible. 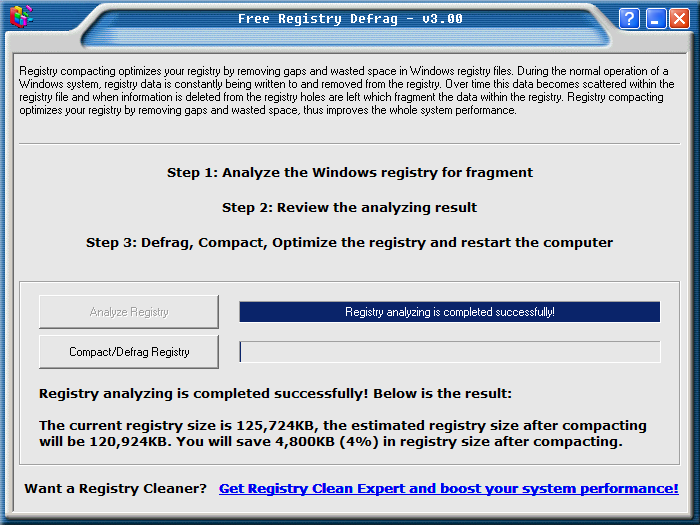 There are multiple tools available for defragmenting the registry, like Free Registry Defrag (download: www.registry-clean.net/free-registry-defrag.htm) or Auslogics Registry Defrag (download: www.auslogics.com/en/software/registry-defrag/, registration is not needed). After analyzing the registry, a window shows what the result of defragmenting the registry will be. ATTENTION: After half a year, there is only a 3% of defragmentation of the Windows 7 registry. Therefore it is questionable whether it is useful to defrag the Windows 7 registry. It is a matter of time before the registry gets clogged with orphaned and misplaced registry values. It is frequently advised to clean up the registry now and then. As a result, many clean up their registry, motivated by all the useless items found at every cleanup. However, most cleaning tools are not without risk: cleaning tools all claim they do a better job then other cleaning tools, which in the end results in more (mostly hidden) problems. They only give the user a good feeling while a faster computer is rarely the case. If you encounter strange problems be warned that this can be caused by a previously used cleaning tool! TIP: If a system image is available, it is better to restore Windows (the registry included) in stead of using a cleaning tool. The registry is frequently read or written to, these registry changes are essential for the well functioning of the operating system and other programs. When irreversible changes are made, there is a chance of big troubles (like not able to boot anymore). That's the reason that most magazines and websites (like this one...) place a disclaimer and warn that manually changing the registry is at your own risk. Why these warnings? It is very difficult to restore a deleted (or changed) registry value to the original value, especially if there is no back-up available. Keeping these warnings in mind, the actual risks are exaggerated. As long as there are no unintended changes to registry keys and values, there won't be large troubles at all (with some exceptions...). Most keys and values can be deleted without getting into any problems (if needed they are recreated by the application which uses them). Always be careful and always work cautious! To be sure, create a backup of the registry keys to be changed first. If there are any problems, there is a back-up available to undo the changes and to restore the original settings. Creating a backup of the registry values in a specific registry key is done by selecting the registry key (in the registry editor) followed by File, Export. The registry values are stored in a file with the extension .REG, which can be read with a simple text editor like Notepad. Importing the REG-file into the registry is similar to exporting them with the option Import or by double clicking the file in the Windows Explorer. TIP: The tool WinRescue (download: www.superwin.com) creates a backup of the whole register. To my opinion, restoring a system image of a problem free Windows installation is a better alternative. Registry values are navigated to by the hive structure of the registry keys (in the left pane of the registry editor). Registry values can be changed after double clicking them. Depending on the type (string, DWORD, Binary,...) the accompanying window is opened and the registry value can be changed. Creating a new, non existing registry value is easy as well. Right click in an empty area of the right pane and select New (or by the menu bar Edit, New), followed by the desired type of registry value. Give the new registry value a name (the name can be changed later on by File, Rename). The actual value can be changed/added by double clicking the newly created registry value. Because the registry contains many registry values, it is impracticable to search for a specific value. However, registry values are quickly found with the search function (Edit, Search or the key combination CTRL-F). The key F3 will continue the search function after the first value has been found. Browse the registry keys values and try to find out what they are for. In many cases it is not that difficult to find out what a registry value is used for (most values can be found somewhere on the internet). For example, the registry key HKCU\Software is used to store the settings of software (for the specific user account). In this key you will find the names of manufactures from previously installed software (Microsoft is mentioned as well). Windows Explorer settings, especially the sub key Advanced has many advanced settings which are not available by the user interface. The application which run at Windows startup. By deleting the values, they are removed from the startup process. These registry values can be changed with the tool MSCONFIG as well. MSCONFIG has the advantage that disabled items can still be enabled if necessary. In this registry key the settings of windows services are stored. The shown registry keys are similar to the earlier mentioned Windows XP services and Windows Vista services. The DWORD Value Start is used for the startup settings of the services (2: Automatic, 3: Manual, 4: Disabled). TIP: This website has multiple registry tweaks available to apply different Windows XP settings (for Windows Vista there is not such page yet because most tweaks can be done with the user interface). For backup purposes, registry values can be stored in a registry file with the extension .REG. A simple text editor like Notepad can be used to view and change the content of those files. Because these registry settings can be applied to any computer, changing those files can be very useful. Many registry tweaks are documented on the internet and can be copied directly into a registry file. The example below shows the content of a registry file for adding the search engine www.google.nl as default search engine to the search field of the Internet Explorer 7. All registry files begin with a specific line to indicate that the file contains registry settings. Registry keys are placed between square brackets ("[" and "]"). The lines below the registry keys show the registry values to be added or changed (in this example most of them are String Values and one is a DWORD Value). Be aware that every key and value are placed on a single row! TIP: Registry keys and values can be deleted with a registry file as well. By placing a minus sign behind the bracket ([-HKEY...) a whole registry key is deleted (all sub keys and registry values included). Specific registry values are deleted by placing a minus sign as value (e.g. : "DisplayName"=-). Copy the above text to an empty file in Notepad and save the file with the extension .REG (e.g. google.reg). By double clicking this file in the Windows Explorer, the registry settings are added to the registry (the changes are definitive). When the values already exists in the registry, they are overwritten by the values in the file. Because the registry keys start with HKEY_CURRENT_USER (the key for the account specific settings), the registry file must be applied within every user account. When the registry file is saved, it can be applied on multiple user accounts and computers later on. Almost all Windows, program and hardware settings are stored in the registry, which can be changed manually. These changes can be stored in a registry file and applied by double clicking this file (in stead of a manual change). This procedure is especially usefull when settings have to be applied on multiple computers. Just change a registry value and monitor the changes. Create two snapshots of the registry (before and after a change) and find the changes by comparing them. Real-time monitoring of registry changes. This method (comparing of snapshots) is very time consuming. For this purpose it is necessary to create two full snapshots of the registry: one before and one after the change. The next step is to compare the two snapshot with a time consuming calculation of the differences. It is a smart and useful procedure for tracking multiple registry changes. Both the tool Advanced Registry Tracer (download: www.elcomsoft.com) and Tracker (download: www.evans-programming.com) follow this procedure (and both are available as a 30 day trial version). Real-time monitoring of the registry has the advantage of immediately displaying the changes to the registry, which makes it less time consuming. The most useful tool for this purpose is Process Monitor from Sysinternals (download: http://technet.microsoft.com/nl-nl/sysinternals/bb896645(en-us).aspx). Process Monitor is a advanced tool for real-time monitoring changes to the registry, the file system and the running processes. After Process Monitor is started, the registry changes are flying over the screen (it is real-time...). The first time you see this, it can be quite overwhelming to see what's going on. Because this tool monitors both registry settings, changes to the file system and the running processes the shown changes are enormous. By using a filter, the continuous flow of changes can be limited to the most important. In the example below the number of events has been brought back from 19.000 (in one single second!) to only 17. Even within a short scanning period, there are too many events to find a specific registry value quickly. For this reason, it is necessary to apply a filter to limit the number of shown events. The first step is deactivating the options Show File System Activity and Show Process and Thread Activity (button 5 and 6). After this filtering, the shown events are limited to the registry events (like the adding, changing and deleting of registry values and registry keys, but also the querying, opening, searching and closing of registry keys/values). These filter rules concern the opening, searching, querying and closing of registry keys and values. Adding these filter rules is quite time consuming, fortunately these rules can be added easily by right clicking an event and to select Exclude, option Operation. Based on the characteristics of a single event, all similar events will be deleted. When the registry value has been found, it's location can be opened automatically in the registry editor by right clicking the event in the Process Monitor and select Jump To. Within the registry editor, the registry key/value can be exported easily to a registry file. TIP: By Options, Enable Boot Logging the changes to the registry and file system can be traced during the startup of Windows. TIP: Right click an event in the Process Monitor and select Stack to find out which processes and threads change the specific registry value. The value in column PID stands for Process ID. This PID can be used to trace the responsible process in the Windows Task Manager (CTRL-SHIFT-ESC) or the Process Explorer (from Sysinternals as well).